At this moment, we are not preparing any concerts. 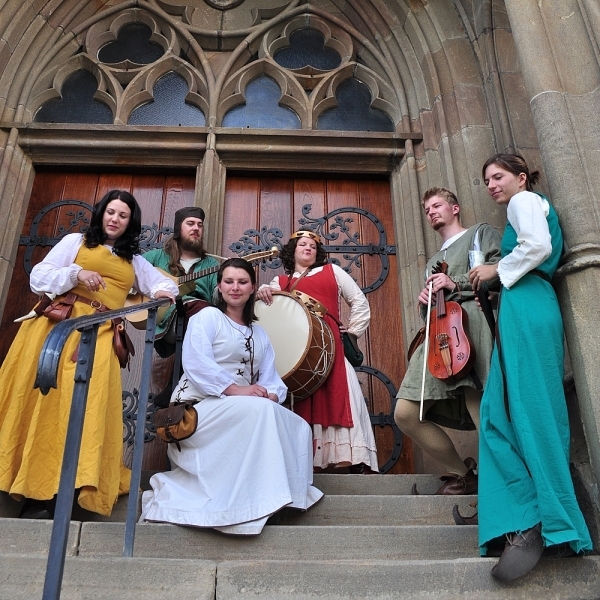 Weytora is a vocal and instrumental musical ensemble dealing with authentic interpretation of European medieval and Renaissance music. Its various repertoire covers a wide range of musical works from unisonous songs to polyphonic compositions of the Renaissance. The ensemble consists of five members, each of them playing several musical instruments. That makes it possible to choose the instruments according to the nature of the piece and to have a wide repertoire which includes different types of music like sacred music, love songs, drunkard songs or dance music. At its performances, Weytora tries to evoke the atmosphere of the period concerned not only by music, but also by using close copies of historical instruments and clothes. It is natural that such a kind of music sounds best in historical surroundings and in acoustic version. Thanks to its instruments, Weytora is able to play some of its music even outdoors without using microphones, if the place is not too large or noisy. We have a new CD - "Narratio de ove et Weytora". It can be ordered on e-shop of agency Fascinum. Samples can be found in section audio.